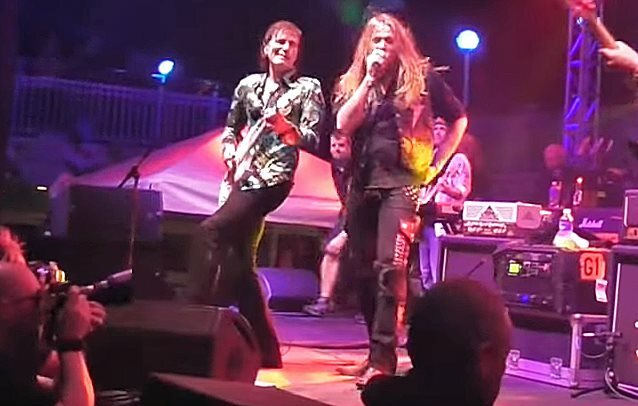 Fan-filmed video footage of former SKID ROW singer Sebastian Bach, legendary guitarist Steve Vai and LOUDNESS axeman Akira Takasaki performing a cover version of the David Lee Roth classic "Yankee Rose" during this year's Monsters Of Rock cruise — the four-day, four-night voyage which set sail from Miami, Florida on February 22 and returned on February 26 — can be seen below. Said Bach in a note accompanying the video: "What a complete honor to play with one of my all time heroes, Mr. Steve Vai. "I got the invitation from Steve to play two David Lee Roth songs with him on the Monsters Of Rock cruise and it was a dream come true. "We did not have anywhere to rehearse, so I practiced on my own about one million times, and I'm very happy to say we did the songs justice! Steve told me this is the first time he has been on stage with a 'lead singer' in as long as he can remember. "The fact that I got to do two of my favorite David Lee Roth songs with Steve Vai himself is something I will never forget! Also, check out the legendary Akira Takasaki from LOUDNESS on guitar here and I even threw in a bar from rock'n roll crazy nights, see if you can catch it! If that's not enough, check out the incomparable Uli John Roth giving me a high-five from the side of the stage! Thanks to the Monsters Of Rock cruise for making it happen!"